Anyways, this is a review of Cellucor M5 Extreme, which is a creatine matrix supplement that contains creatine and a whole matrix of other ingredients. This is a pre-workout supplement that's designed to give your a massive boost during your workouts, resulting in increased intensity, endurance, and focus. Some of the key ingredients include: Waxy Maize, Taurine, Creatine, Arginine Alpha-Ketogluterate, Citrulline Malate, and caffeine. Some of these, you may already be familiar with, and some of these, you may not. 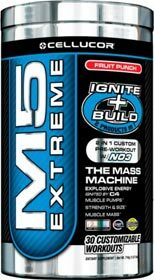 Below is a complete list of Cellucor M5 Extreme ingredients, and in this review, we'll look at some of these in detail, and then discuss the effects of this pre-workout supplement. As mentioned earlier, M5 Cellucor is a pre-workout supplement that contains a mix of ingredients. Here, we'll quickly look at some of these key ingredients. Waxy maize is also known as Amylocel, and it is a "high molecular weight" (HMW) carbohydrate. The benefits of a HMW carbohydrate is that it has low osmolality, and is able to bypass the stomach and allow for almost immediate absorption in the small intestines. Because of this, pairing of waxy maize with other supplements such as creatine can help improve the absorption rates. This deserves an entire topic by itself, so I won't go in more details about waxy maize here. However, we have an in depth article discussing waxy maize here. You probably know what Arginine Alpha-Ketoglutarate is, as it's mentioned quite often on our site here. 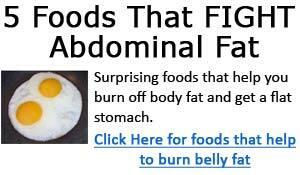 It's a very common ingredient that you find in various bodybuilding supplements. Citrulline Malate is another very interesting ingredient, that I've personally experimented on many occasions. I've taken a real interest in this ingredient because of its superb effects for regulating nitric oxide and raising arginine levels. This supplement has been shown in studies to reduce the sensation of fatigue, greatly increase ATP production, and increase phosphocreatine recovery after exercise. I won't bore your with all the scientific studies and research evidence which backs up these claims. I have extensively discussed the effects of citrulline malate in other articles and explained why it's a key ingredient that I use in my homemade supplement stacks. As far as pre-workout supplements go, I've tried a lot of them. For the price I paid for Cellucor M5, I was expecting a little more. The effects were noticeable - I had some great pumps, a little bit of lean gains, more energy and focus, higher workout intensity, more endurance, and I was able to training harder, longer. But this all came at a pretty hefty price tag. With M5 Cellucor, I had some excellent training sessions with sustained energy. On many occasions, it made me feel that I could just go on and on and on... With the normal weights I used for training, I could consistently pump out 2 to 5 more reps, and I had increased my weights on most exercises by 5 to 20lbs and still crank out as many reps as previously with lower weights. So yes, cellucor M5 works, and worked quite well for me; however, I feel that it is quite expensive, and there are cheaper alternatives available. But if you don't mind the price tag, and are looking for a pre-workout supplement that delivers, then give Cellucor M5 Extreme a Try.